My father is gone. We've been going through everything in the house with my mom's help. 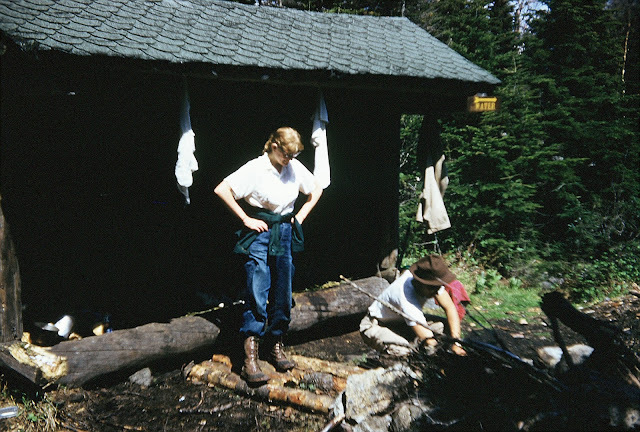 Ah, the Adirondacks, where they met and spent their honeymoon and managed two lodges and took us kids hiking and camping. Lean-tos are a big part of that memory. If you ever read Bill Bryson's A Walk in the Woods, these are the huts he refers to. 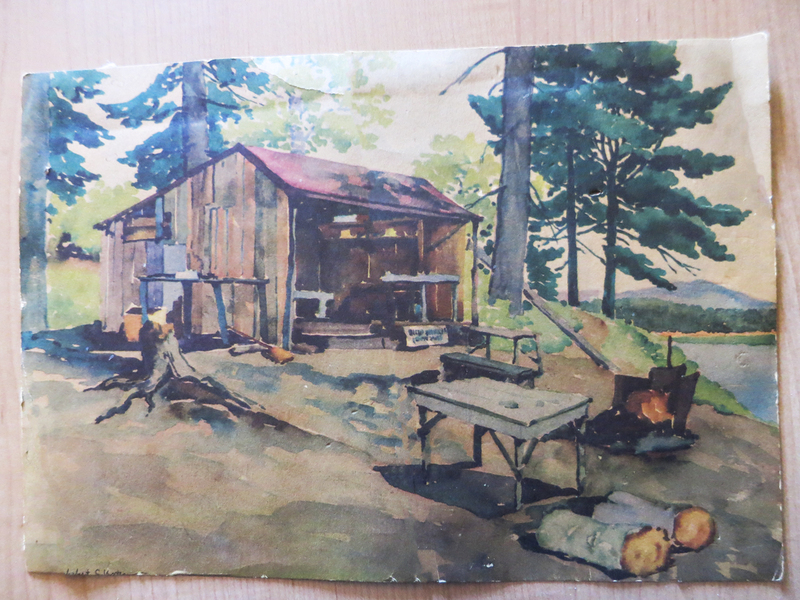 Found this watercolor of a lean-to that my mom used to display. Source unknown. 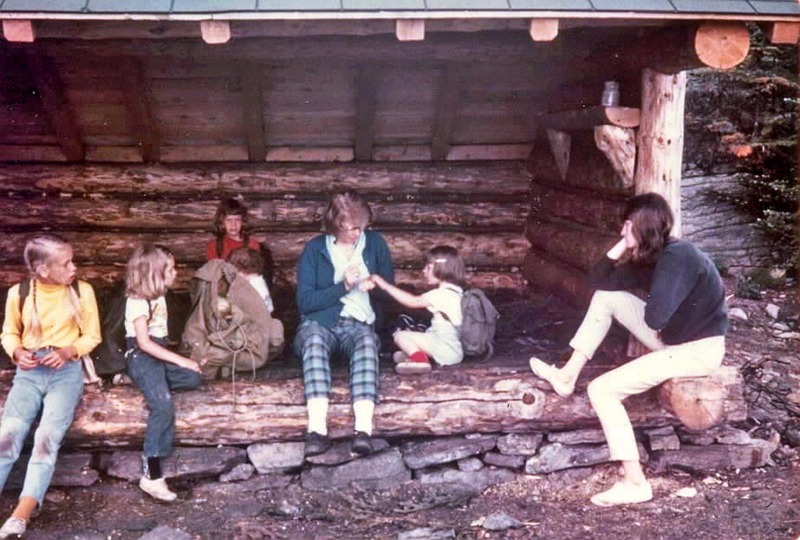 Here's mom camping at a lean-to when she and dad were dating, Dad behind camera. All of us out for a day hike (plus at right a lanky neighbor teenager sometime-babysitter), Dad behind camera again and his usual giant pack among us. Dad before we all arrived, not in a lean-to, but undoubtedly near one. Love these. Hope you keep the watercolor. Great memories for your mom and all of you kids too. We were in that area yesterday and the day before. Still overwhelmingly beautiful. It's hard what you're doing. Sorting. And so soon. We had our worst fight ever as a group of kids while doing that. Wish there was a way to make it easier. But there is not. Hugs to you all. Especially your Mom who I've never met but I think she is very much like my own mom. Thanks. Yes, stress and tempers have flared a bit, often just over communication. Trying to do mostly by email because then all 5 of us get the same message. Then 2 sisters don't read email but once every couple of days sometimes. Which frustrates them when they discover that the rest of us are planning one thing and they're planning something else. And frustrates me because I don't really want to call 4 people every time some decision or plan or suggestion comes up. It's more that than the actual sorting. I'll give my mom an extra hug for you. It's a very difficult thing and time. Don't beat yourself or anyone else up. Sometimes you have to back away and give everyone time to breath unless there's some time constraint that requires all of this to be done right now. Thanks for hugging your mom for me. I explained about the extra hug when I went over there that evening, and she said thanks! Don't know why....but that made me tear up. Can I adopt her? I think she'd be honored. I need to try to get her a special email system set up that she'll be able to navigate on her own.